Seeking relaxation? 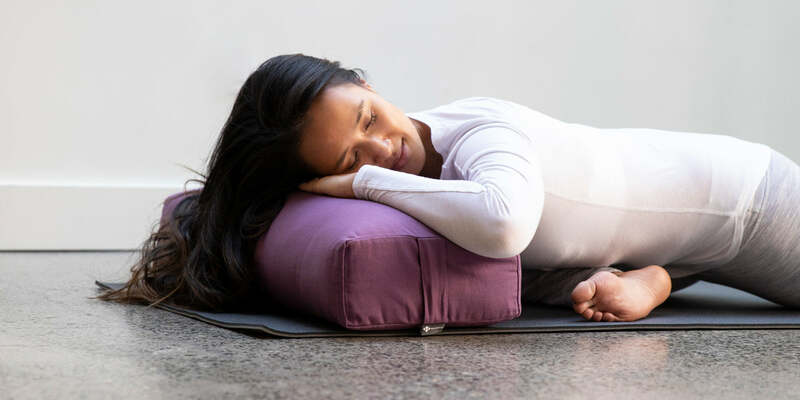 Grab your yoga bolster and try these five restorative poses. Restore the natural curve of your spine while opening your chest, shoulders, arms, and abdomen. Feel ease and spaciousness, while stimulating your nervous system, heart and lungs. Sit comfortably, legs extended in front of you. Place the bolster behind you, in line with your spine. head to rest on the bolster, use cushions, blocks, or stacked blankets. Relax your arms to the side, palms up. Release your neck and shoulders, gently tucking your chin. Keep your legs extended, or try bending your knees, feet on the floor. You can also place the soles of your feet together, with your knees apart. Place your bolster at the top of your mat. Bring your right leg forward and cross it over to the left so that your knee is close to 90 degrees. Modify if needed. Extend your left leg behind you. Lean forward and rest your head and forearms on the bolster. Add additional support where needed. Our favourite supine twist does it all: opens the muscles between your ribs, improves spinal flexibility, massages your internal organs and calms your nervous system. Lay down on your back with your legs straight along the mat, and your Rectangular Yoga Bolster along your right leg, lengthwise along the ground, in line with the edge of your mat. Extend your hands out into a “T” shape, or bend the elbows to 90 degree, making a “cactus” shape. Hug your left knee into your chest, bending at the knee, and gently lower your leg across your body so your shin comes to rest on the bolster. To intensify this twist, turn your gaze away from your leg, and to reduce the intensity, or change the location of the twist in your spine, move the knee closer or further from the face. Keep both shoulder blades grounded to the mat. Hold for at least 10 breaths, and feel your spine lengthening as you spend more time in your twist. To come out of the twist, extend both legs long along your mat, bring the bolster to the other side of your body, and repeat. AKA Legs up the Wall, this pose is an important inversion that helps to reduce stress, quiet the mind, lower blood pressure, and induce relaxation. It also reduces swelling, improves circulation, and may prevent varicose veins. What more can we ask! Lie on your back facing a wall, feet on the floor and knees bent. Have your Rectangular Yoga Bolster at your side. Raise your legs and slide your body forward until your bottom and the backs of your legs are resting against the wall. Wiggle and adjust as needed. Once you’re feeling comfortable, bend your knees so that your feet are against the wall.Press your feet to raise your pelvis, and slide your yoga bolster under your bottom. Gently straighten your legs. Relax your arms to the sides, releasing your shoulders. Or place your hands on your abdomen and feel your breath. When you’re ready to come out of the pose, hug your knees to your chest for a few breaths, then roll to one side to release completely. Said to be as restorative as a full night’s sleep, child’s pose gently opens the length of your back, especially your sacrum and hips. Kneel with your knees far apart (much wider than your torso), and the tops of your feet relaxed. You may want to cushion your knees and feet with a thick yoga mat or yoga blanket. Relax forward and rest your head and upper body on the bolster. Place your arms at your side, extend them out in front of you, or fold them on top of the bolster. Gently press your forehead into the bolster to lengthen the back of your neck. Breathe fully to expand your back ribs.